Last Friday, I finally kicked myself into visiting my favourite Japanese Cuisine Restaurant after a long absence, namely Tomii. 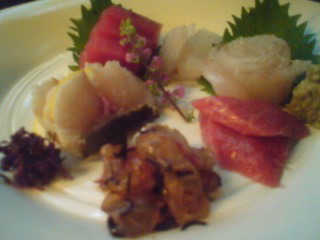 As I had a couple of commitments later in the evening I opted for one of their renown sashimi sets. 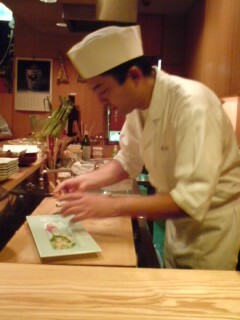 As I had come early enough, I had all freedom to take a couple of pics of the chef at work! 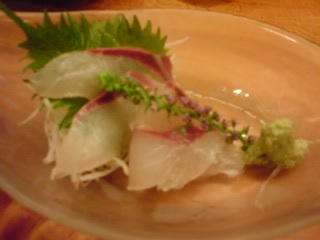 Makogarei/Halibut Variety (on a shiso leaf), Hamo/lightly boiled pike conger eel (decorated with shiso flowers, Rowena! 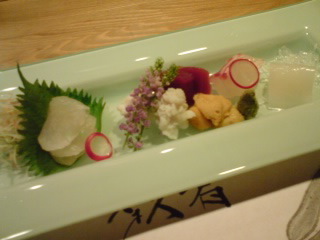 ), Akami/lean tuna, Madai/seabream, Uni/Sea Urchin and Aka Ika/red cuttlefish. 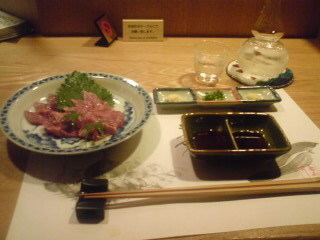 I was still a bit hungry and espied the Gyuusashi/Raw beef on the menu! I just could not resist it! 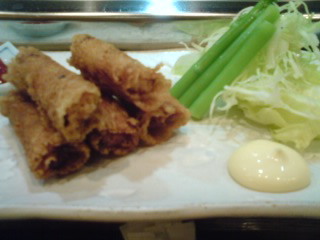 Served with two small plates of soy sauce, some grated ginger, grated garlic and thinly chopped thin leeks, a pure delice! Thursday! If everything goes well (Rowena, don’t start shooting!) t means eating out with the Missus. Well, no surprise at all, as she requested we visited that (ver) old favourite of ours, namely Sushi Ko Restaurant in Shizuoka City! No need to explain anything. Let’s keep to the basics and explain some of the morsels we ordered (not all, as it would become a boring repeat!). 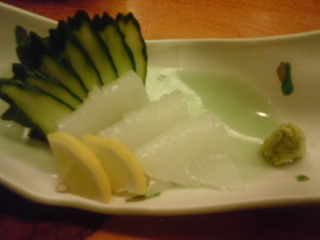 Above is “Ika Somen/cutte fish cut very thinly, hence the name “somen/thin noodles”. The cuttle-fish variety is “Yari Ika/Halberd cuttle fish or calamari in Italian”. 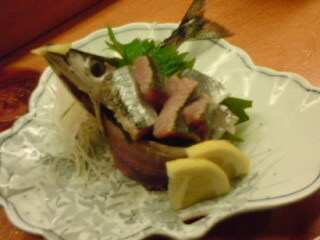 “Sanma/mackerel pike”, a seasonal fish, although tis particular one came from Hokkaido. We shall have to wait until September for the Shizuoka specimen! 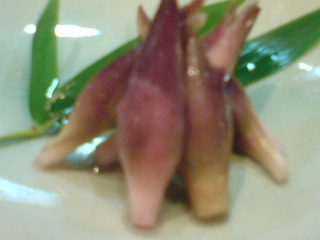 “Shima Aji/Saurel variety”. Another seasonal fish. Almost sweet! 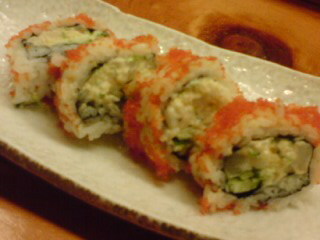 We could not resist from ordering that very special maki/roll: “Piri kara hotate maki/hot scallops roll coated with “tobiko/flying fish roe”. That one is for you, Allison! Finally, my favourite (my wife tends to shun it! 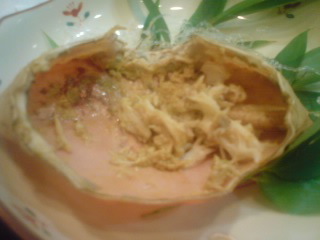 ): Japanese Foie Gras/Ankimo-Frogfish Liver! 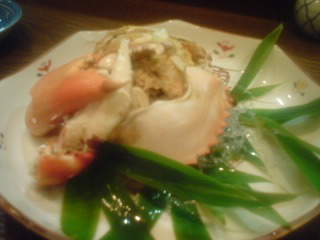 “Douman” is the name of a very rare crab of fairly large proportions exclusively caught in Summer in Lake Hamana, Shizuoka Prefecture. 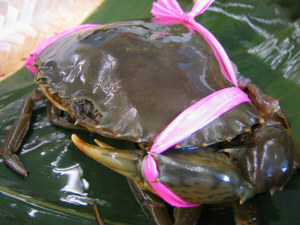 Fishermen will be lucky if they manage to find 2 or 3 specimen caught in their nets in a single day for the whole lake! It has become one of the symbols of the area as demonstrated by the rice/kome shochu of the same name brewed by Hamamatsu-Tenjingura Brewery/Distillery in Hamamatsu City. Consequently only a few privileged establishments may serve it from time to time. 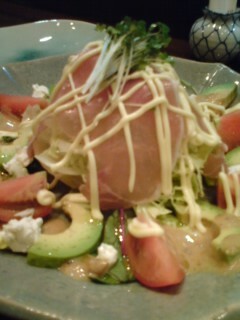 One such place is Suehiro-Hamanako No Megumi Sushi Restaurant, a little secret place of mine. As introduced in other articles, it is tucked away from the city bustle south of Hamamatsu JR Station. I make a point to reserve a seat or two before I visit them as hey will make sure to keep a bottle of Shizuoka Sake just for me. Last Friday, they just happened to have an excellent bottle from a favourite Brewery of mine, namely Hatsukame in Okabe Cho. That particular brand, called “Fujisan”, is a honjozo made with rice from Toyama Prefecture and yeast from Shizuoka Prefecture, perfect in summer with sushi and seafood! Light food was on order as it had been an excessively hot day now that the rainy season is finally off our heads. 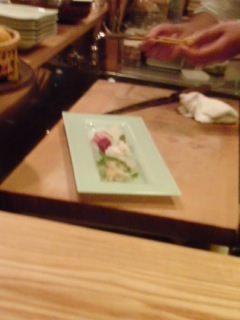 Pickled myoga, and ham and avocado salad were perfect with the first couple of glasses of chilled sake. With a kitchen conveniently closed away, Suehiro has the knack to serve the right mixture of sashimi, sushi and cooked fare which ensures you will not leave the place worrying about a still empty stomach. Mind you, this is an expat notion which does not count for the Japanese habit to visit at least two or three different places in the same night. 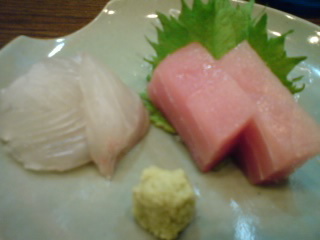 We opted for some akami/lean tuna and suzuki/seabass sashimi and a plate of Hamana Lake prawns deep-fried inside Spring rolls. 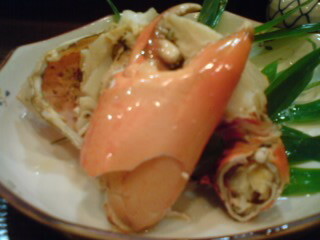 Finally we were ready for the Douman Crab! 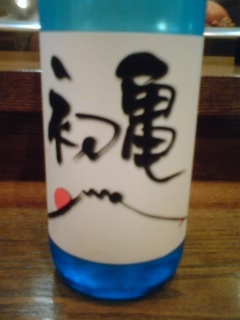 My friend took the opportunity to order a glass of shochu of the same name while I gamely took care of the sake. 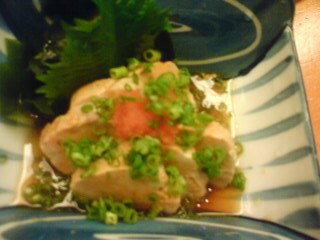 In Hamamatsu City they just serve it steamed as it is without any dressing or seasoning. And our half (can you imagine the price of a whole one?) did not need any whatsoever. 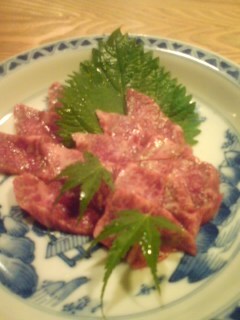 It came very full of so soft, tasty, even sweet meat that you naturally take your time savouring a little at a time with chopsticks. Forbid a fork or spoon! 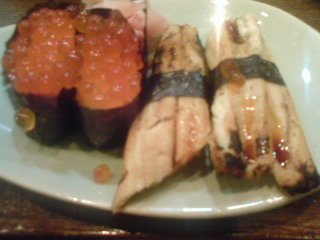 We still hjad one more morsel before we left for the Liquid Kitchen, a bar held by a cricket friend of mine: Hamana Lake anago/conger eel and ikura/salmon roe sushi. As this restaurant always comes up with local delicacies on a purely seasonal basis, I wonder what will compel me to visit it again! Thin slices of Isaki/a variety of grouper typical of Suruga Bay intersped with thin slices of lemon, Akami/Lean tuna, Suzuki/Seabass, Hirame/Sole, Chutoro/semi-fat tuna and Hirame Konbu Jime/Sole marinated in seaweed.